Here is another example of Kava that was tested in late 2016. Like a number of samples we’ve received and tested recently, this one also came up positive for E. coli. It’s an unfortunate trend, making it even more important that any Kava products you plan to purchase, especially in large quantities, gets tested first. The Colorado Department of Health has a handy E. coli Safety Guide that you can download, just to get an idea of how serious it can be that your product has E. coli in it. As happens in Oceania, flood water often contains raw sewage. Raw sewage can contain certain germs such as bacteria, viruses, and parasites. The risk of illness depends on how you were exposed to the flood water or sewage and how long you were exposed. The most common mode of infection though, is through ingestion (swallowing tiny bits from your hands or from contaminated foods or water, such as Kava Kava Root. Simple skin contact poses a health threat if you have an open wound. For you, the risk of infection when handling sewage or flood water can be reduced significantly by effective and immediate clean-up and by taking appropriate safety precautions. Here are the three main dangers in sewage, runoff, or flood waters. Bacteria (examples: E. coli, salmonella) may cause diarrhea, fever, cramps, or vomiting. Viruses (example: Norovirus) may cause vomiting and diarrhea. Assume that anything touched by sewage is contaminated. This includes most of the flood water from the September 2013 floods. Avoid sewage-contaminated water if possible. Follow any boil water or bottled water advisories in your community if there is any sewage or other contamination of your water supply. Do not eat or drink in areas near sewage. If you’ve been in contact with flood water, wash your hands well with soap and clean water before eating or touching your mouth or face. Immediately wash and disinfect any cut or scrape that comes into contact with flood water. Shower and change out of your clothes if you are in contact with flood water. Launder clothes separately or throw them out. Wash your hands with soap and clean water after touching any surfaces or objects that may have been contaminated with flood water. Vaccinations: If you may have been exposed to sewage in flood water, you need to be up-to- date on your shots for tetanus and diphtheria. 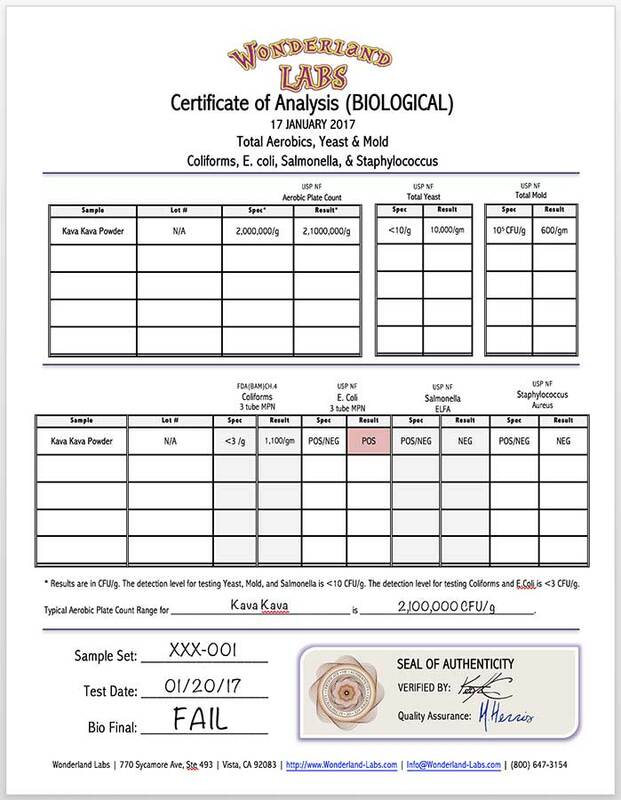 Another curious thing to note with this particular Kava sample, is that it contains a high level of mold. It’s common for root material to have mold, and most mold is harmless. But, too much mold in your Kava can not only make for a bad taste, it can ruin the Kava experience. The mold eats away at the Kavalactone. Over time, your Kava, especially if stored improperly, or not properly handled before it was packaged, will get worse with time. 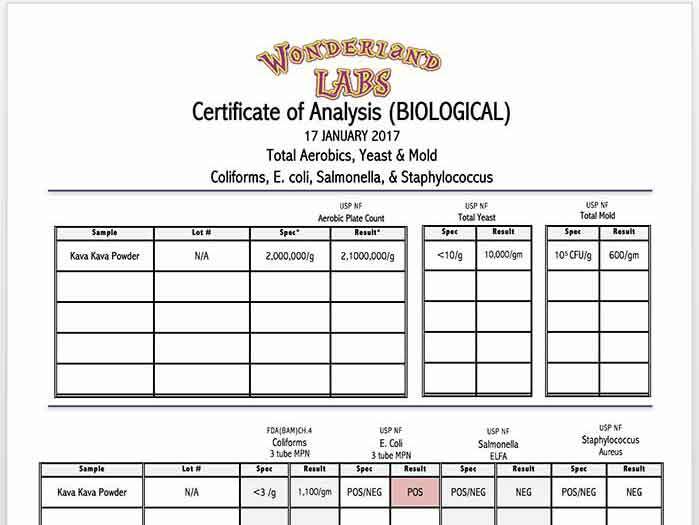 This is why we can’t stress enough to buy Kava from companies who provide a signed Certificate of Analysis such as Wonderland-Labs. Yes, it’s obviously in our best interest for you to want to get all of your products tested, but with so much Kava root powder coming up positive for dangerous pathogens such as salmonella and E. coli, it’s almost imperative. This is just one case study. WE’ve had hundreds of Kava samples through our lab in the last 6 months alone. We’re at nearly 20% positive for some kind of pathogen; that’s a lot of bad Kava floating around the marketplace, and a lot of potential for harm. The more people get sick from the Kava that’s available, the more Federal Agencies will be forced to take a look at it, and the more a Kava supplier might find an FDA agent at their door to find out if you’ve got the necessary paperwork to prove that your product, whether it’s Kava or any other product, is safe for the general public.